Merry Christmas from everyone at Imagine Crafts. When I was asked to make something for this special day, I wanted my project to be truly elegant. The Silver and Navy against the white just pops! 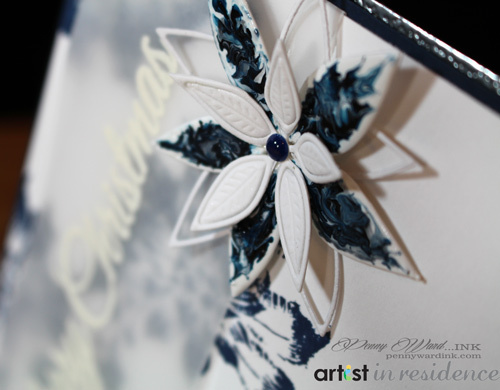 The poinsettia with the swirled Pico Embellished highlights is both beautiful and unusual. I love making cards and gifts that match and I’m pretty sure the recipient of this set is going to love it! 1. Cut white card stock 4.25 x 11 inches, fold in half. 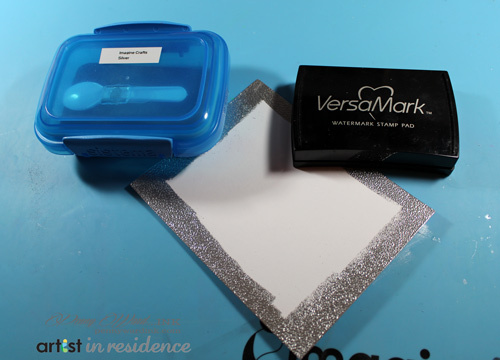 Ink outer edge of card base with VersaMark ink, then sprinkle Silver embossing powder and heat set. 2. 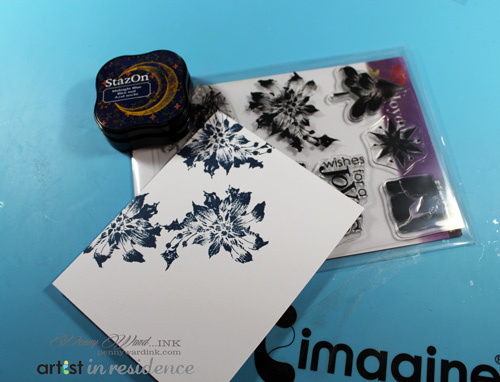 Cut white card stock 4 x 5.25 inches, stamp poinsettias with StazOn Midnight Blue ink. Cut vellum 2 x 6 inches. Stamp and heat emboss sentiment. Adhere Vellum to back of white panel, trim ends. Adhere this panel to navy card stock trimmed slightly larger. Adhere this whole panel with foam adhesive to the card base. 3. Die cut Poinsettia Trio from white cardstock. On the largest Poinsettia, add a few drops of irRESISTible Pico Teal Zeal to center of petals, add Pico Wedding Dress around the Teal Zeal. With a toothpick, start swirling the two colors together. Repeat for each petal, then let dry. 4. Adhere your gorgeous Poinsettia together, then to card front. Place Enamel dot in flower center. The ornament is a cut file from the Silhouette Online Store sized to 4 inches. 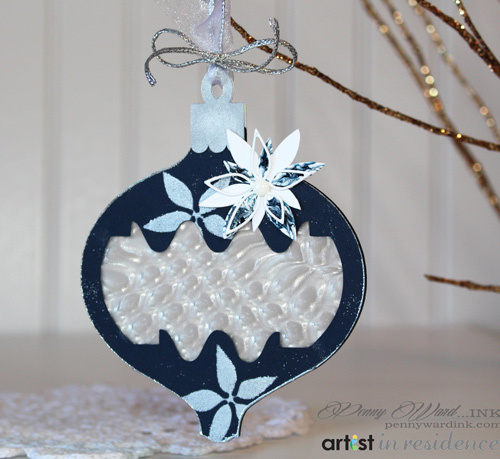 The center was cut out from the ornament– you’ll need to cut two of these for this project. 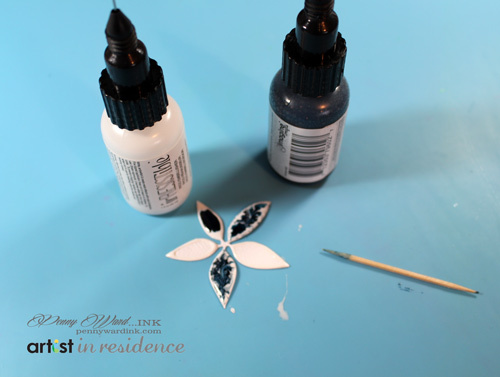 Stencil the negative of the Poinsettia die with Delicata Silvery Shimmer. Heat emboss the edges with Silver embossing powder. Vertigo was used for the center of the ornament. 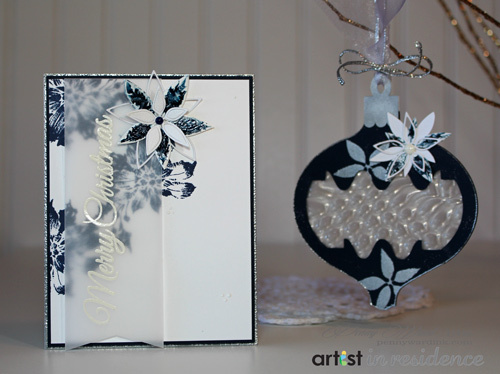 Same technique used for the card was also used for this Poinsettia embellishment. Attach ribbon and cord to hang ornament. This entry was posted in Cards, Home Decor, Penny Ward. Bookmark the permalink. This is absolutely stunning!! LOVE how you swirled the Pico Embellishers on the poinsettia! TFS! Beautiful Pen, absolutely beautiful. You are so gifted.